KENTISH Town residents and community groups are doing battle with the council and property developers in a last-ditch effort to save a park. Objections from Neighbourhood Watch and residents associations have forced Cornwall Overseas Development Ltd and Camden Council to justify road changes needed for the construction of a seven-storey, 55-apartment complex next to Talacre Gardens on Prince of Wales Road. Although objections to the building were overruled when the planning application was approved in January 2005, the protesters hope to persuade a government planning inspector that road changes are unsafe, impractical and ultimately costly to the taxpayer. The plans require permission to “stop up” Dalby Street, the current access road to the Talacre Sports Centre, and build on it. 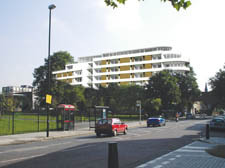 Developers would construct a “New Dalby Street’ alongside. At the inquiry, which began on Tuesday at the Thistle City Barbican hotel, Talacre Neighbourhood Watch chairwoman Celine La ­Freniere outlined the objectors’ case. The council’s environment chief councillor Mike Greene approved the road changes “with reluctance” last year but insisted that the developers agree to pay for round-the-clock traffic marshalls at the potentially dangerous junction. Although the developers agreed, and offered to provide a £1.1m bond to guarantee the scheme, Ms La Freniere said that enforcing it would be beyond the council. The council, as highway authority, is now in the position of supporting the changes for the private development. Five staff are at the inquiry, with council engineer Dave Jenkins stating that the road changes meet highway standards. Cornwall Overseas Development, a British Virgin Islands-registered company, bought the land from Camden-based TRAC properties in May 2005 for £3.4m. TRAC paid £190,000 for the derelict house at 52 Prince of Wales Road at the centre of the scheme and secured an undisclosed deal to buy the rest of the site, which included two Travellers’ pitches, from Camden Council. The inquiry concludes on Friday, when inspector Colin Tyrrell will prepare a judgment for London Mayor Ken ­Livingstone.